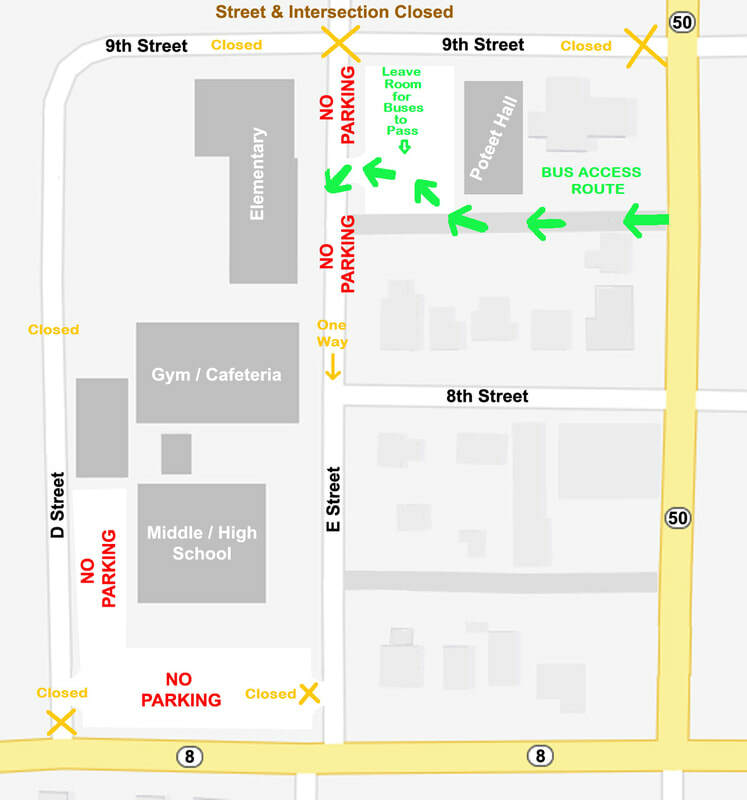 D Street and 9th street around the west side of the school will not be open for traffic by the time school starts, nor will the intersection of 9th and E streets in front of the school. This will make E Street—the street in front of the school on the east side, where buses drop off students—inaccessible from the North. It is unclear at this point how soon these streets will be accessible. Additionally, concrete construction will be taking place in the school parking lot south of the high school, so no students will be allowed to park there until further notice, nor will they be allowed to park on E Street. Therefore, students will need to park on side streets and walk to the school, until streets and parking lots become available. Also, to accommodate to buses accessing the school for student drop off, we ask that cars park wide enough in the school parking lot west of Poteet Hall to allow buses to pass through the alley turn onto E Street from the parking lot’s west exit. No cars will be allowed to park on either side of E Street in front of the elementary building, so that buses are able to navigate that turn. If you have any questions about any of this information, please feel free to call the school to request clarification.